These sinfully delicious chocolate truffles make the perfect gift for any special occasion but especially Valentine's Day or the Holidays. Buy some beautiful tins and boxes and spend an afternoon or evening making this simple recipe that will wow your friends and family. They'll love you forever for making them such a decadent, delicious gift. 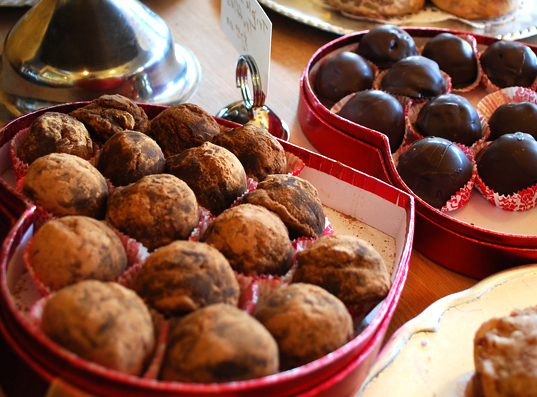 These truffles are easy to make, if you don’t mind getting your hands a little messy. They make wonderful holiday gifts, or serve them with coffee at the end of a special meal. If yours appear somewhat misshapen, fear not; they acquired their name for their resemblance to real truffles, (the kind that come out of the ground). Small foil candy cups will keep them from sticking together and make for pretty packaging or serving. Go to your local craft store to find decorative tins or boxes to put them in and you've solved the puzzle of what to give your favorite friends this holiday season. Finely chop chocolate into small pieces. Place in a medium heatproof glass bowl and microwave 30–45 seconds. Add butter to chocolate. a rubber spatula, slowly stir in a circular motion, starting from the center of the bowl and working out to the sides. Be careful not to add too much air to the mixture. Stir until all the chocolate is melted, about 2 minutes. It may look done after 1 minute of stirring, but keep going to be sure there are no lumps. Add liqueur and stir to combine. Allow to cool until firm; this might take several hours at room temperature or an hour or more in the refrigerator. Once the mixture is firm, it can be formed into truffle balls. Using a mini ice-cream scoop, large melon baller, or a tablespoon,shape into 1΄΄ balls on a sheet tray lined with parchment paper. Roll the blobs into somewhat uniform balls by hand. This is messy. If they begin to warm up and become soft, refrigerate for 10 minutes or so. (It’s a good idea to wear food-safe gloves to do this). After the truffles are formed, drop them into a bowl of cocoa powder to coat. Finely chopped toasted hazelnuts or almonds are another option, although I prefer the luxurious smooth texture from simply rolling them in cocoa powder. Store refrigerated in an airtight container. Allow to come to room temperature for serving. Want more delicious dessert recipes? We've got lots of them in our Feel Good Food Cookbook. Get a copy here.